A Modern Twist on the Famous Hair-Raising Fable Rapunzel Unravels This Spring! BURBANK, CA, January 24, 2011 - Grossing over 400 million dollars in global theatrical sales to date, Tangled , The Walt Disney Studios blockbuster animated feature that takes a modern twist on the famous hair-raising fable Rapunzel, debuts as the ultimate 4-Disc Disney Blu-ray Combo Pack (3D Blu-ray + Blu-ray + DVD + Digital Copy in a single package) on March 29, 2011. As the 50th full-length animated feature in The Walt Disney Studios' celebrated library and the first animated feature film to ever debut day-and-date on Disney Blu-ray 3D, Tangled 's uniquely packaged home entertainment release ensures that viewers of all ages can enjoy this film on a variety of superior, hi-def media platforms while diving further into the history and quirky details behind the making of this film via amusing and informative bonus features. Featuring unexpected heroes, magic, laughter and adventure, this animated feature is supported by an amazing cast of voice talents including Mandy Moore (A Walk To Remember, The Princess Diaries) as Rapunzel, Zachary Levi (TV's Chuck, Less Than Perfect) as Flynn Rider, Brad Garrett (TV's Everybody Loves Raymond, 'Til Death) as Hook Hand Thug, Donna Murphy (Spider-Man 2, The Fountain) as Mother Gothel, and Ron Perlman (Hellboy, Hellboy II: The Golden Army, The City of Lost Children) as the Stabbington Brothers. From directors Byron Howard (BOLT) and Nathan Greno and the award-winning songwriter of The Little Mermaid and Beauty and the Beast, Alan Menken, TANGLED's hair-raising adventure keeps viewers entertained throughout with its exciting storyline and memorable melodies. TANGLED hits store shelves this spring and is available as a 4-Disc Blu-ray Combo Pack (Blu-ray 3D + Blu- ray + DVD + Digital Copy) for the suggested price of $49.99 US/$56.99 Canada, a 2-Disc Blu-ray Combo Pack (Blu-ray + DVD) for $39.99 US/$44.99 Canada and/or a 1-Disc DVD for $29.99 US/$35.99 Canada. Untangled: The Making of a Fairy Tale - Exactly how long is Rapunzel's hair? How many lanterns were used? Where did Pascal's name come from? Which Disney animated feature first utilized CG animation? These and more will be answered when Mandy Moore and Zach Levi take viewers on a kooky behind-the-scenes tour to learn how the filmmakers styled this film's Golden Tresses. Deleted Scenes - Co-directors Byron Howard and Nathan Greno introduce three scenes and illuminate why they were ultimately cut. Extended Songs - The complete versions of two great songs are shared in a unique feature that explains the co-directors decision to scale them down. Two Original Storybook Openings - Two alternate versions of the film's opening sequence described by co-directors Nathan Greno and Byron Howard. 50th Animated Feature Countdown - A video montage celebrating Tangled as the 50th film to join The Walt Disney Studios' prestigious lineup of classic animated features. 9 Tangled Teasers - A collection of the most unique and quirky commercials made for the theatrical release of Tangled. Some are spoofs based off of infomercials and/or breaking news, some are teasers and others are simply just funny filmstrips. 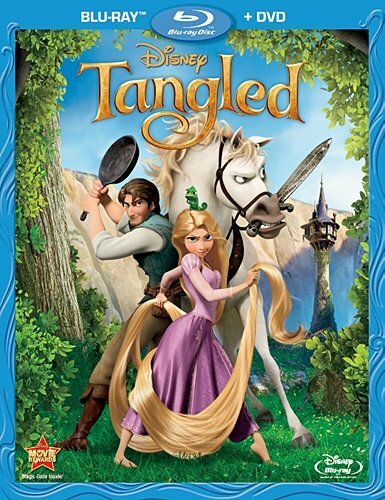 When the kingdom's most wanted--and most charming--bandit Flynn Rider (voice of ZACHARY LEVI) hides out in a mysterious tower, he's taken hostage by Rapunzel (voice of MANDY MOORE), a beautiful and feisty tower-bound teen with 70 feet of magical, golden hair. Flynn's curious captor, who's looking for her ticket out of the tower she's been locked away in for years, strikes a deal with the handsome thief, and the unlikely duo sets off on an action- packed escapade, complete with a super-cop horse, an overprotective chameleon and a gruff gang of pub thugs. Tangled is a story of adventure, heart, humor and hair--lots of hair. For more than 85 years, The Walt Disney Studios has been the foundation on which The Walt Disney Company (DIS: NYSE) was built. Today, the Studio brings quality movies, music and stage plays to consumers throughout the world. Feature films are released under four banners: Walt Disney Pictures, which includes Walt Disney Animation Studios and Pixar Animation Studios; Disneynature; Touchstone Pictures; and Marvel. Through the Home Entertainment division, innovative distribution methods provide access to creative content across multiple platforms. Original music and motion-picture soundtracks are produced under Walt Disney Records and Hollywood Records, while Disney Theatrical Group produces and licenses live events, including Broadway theatrical productions, Disney on Ice and Disney LIVE! For more information, visit www.disney.com.